Additionally, he represented the United States at the 1990 World Collegiate Taekwondo Championships (Santander, Spain), 1993 World Taekwondo Championships (New York, USA), and 1995 Pan American Games (Mar del Plata, Argentina). After retiring from sparring competition in 1995, Master Cooley began focusing his energy on his do-jang and students, as well as the overall development of Taekwondo as a martial art and sport in his community. He served as the Indiana State Taekwondo Association President of USTU (now USAT) from 2000-2003 where he and his dedicated administration significantly increased membership and participation in Indiana. Indiana was recognized with awards by USTU including: Best Dressed State at the Junior Olympics (2000) and the Presidents Award in both 2001 & 2002. Master Cooley has also written articles both as an athlete and as State President that have been published in the USA Taekwondo Journal. In 1998, Master Cooley was awarded “Instructor of the Year” by USA Taekwondo for his leadership, support and development of Taekwondo. Master Cooley participated in the 43rd WTF International Referee Certification Seminar in 2002 in Quito, Ecuador. He successfully passed all the requirements becoming certified as an International Referee (IR-3). He has taken the knowledge acquired from this and other educational opportunities and passed it on to his students and other members of the Taekwondo community with the continual goal of bringing the art and sport of Taekwondo to a higher level in his region. Master Cooley continues to coach and develop athletes and has produced countless state and regional champions over the past two decades. Additionally, his students have won National Collegiate Championships and medaled at U.S. Nationals, Junior Olympics and the U.S. Open. 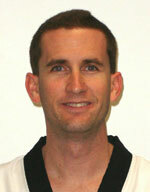 Master Cooley’s goal is to see his students excel and become more successful than him both competitively and in life. The experience at the 1st World Poomsae Championships motivated Master Cooley to continue competing and improving himself. 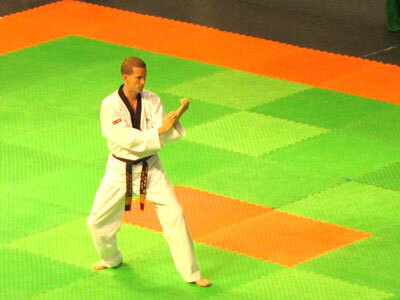 Since that first experience, Master Cooley has continued to grow and improve in poomsae competition. He has represented the United States seven times at the World Poomsae Championships from 2008 – 2015 in various divisions each year – Individual, Pair, and Team – as well as been the U.S. Poomsae Team Captain. Master Cooley is one of very few individuals in the United States who holds the distinction of having represented our country in both Poomsae (forms) and Kyoroogi (sparring) at an offical World Taekwondo Federation (international) level. Master Cooley and his wife, Julie, married in 1994. They are blessed with two beautiful children, Grant and Jillian. He considers family and faith his first priority and cherishes the time spent with his wife and children each day. From the early 1980’s through the mid-1990’s, Master Cooley competed and won dozens of local and regional Taekwondo competitions in sparring, form, and board breaking events. This included eight consecutive Indiana State championships from 1986 -1993; two National Championships in two different weight classes; two U.S. Olympic Festival Gold Medals; and spots on the U.S. National Taekwondo Team in 1989, 93, 94, & 95. Below is a list of his accomplishments in national and international Taekwondo events.